This year has proved to be quite an interesting one. Most producers were able to put up plenty of hay. However, due to average to above average rainfall, a large proportion of the hay produced was harvested at a later than ideal maturity. Based on the samples submitted to the UGA Feed and Environmental Water Laboratory, we are dealing with lower quality forage for winter feeding. For producers with a late winter/spring calving season, this could cause potential issues. Combining this with a few other observations, here are a few situations we are seeing, and the potential ramifications. I will restrict feed in the last trimester to decrease calf birth weights. There is a tendency to under estimate crude protein and over estimate energy. I will restrict feed in the last trimester to decrease calf birth weights. Is this correct? Absolutely! The problem is that is not the only thing it will affect. Recent research has focused on fetal programming. Fetal programming is the concept that maternal stimulus or insult during fetal development has long-term effects on the offspring. One of the most critical aspects of fetal programming involves adequate nutrition, or lack thereof, for the dam. Research has shown minimal impact on calf birth weights, however restricted nutrition during the last trimester decreased weaning weights, finishing weights, and hot carcass weights. Additionally, research from Nebraska indicated that heifers from nutritionally restricted cows reached puberty 14 days later than those with proper nutrition. I need more protein to go with my hay. Is this correct? Possibly, however protein is only half of the equation. From April 1 to November 1 of this year, 1,260 bermudagrass hay samples and 291 fescue hay samples were submitted to the UGA lab. The mean crude protein and energy (TDN) values were 12.1% and 53.4%, respectively for bermudagrass, and 14.2% and 55.2%, respectively for fescue. Figure 1 represents the CP and TDN requirements of a brood cow throughout the production year. As you can see, as cows are entering the final trimester, their CP requirement is exceeded by the average bermudagrass and fescue sample, but the energy requirement falls short for bermudagrass. 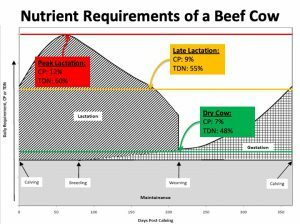 More importantly, the CP requirement is met for peak lactation, but falls tremendously short for TDN. There is a tendency to under estimate crude protein and over estimate energy. The cheapest money you will ever spend in a beef cattle operation is a forage test, guaranteed!!! As part of the recent Master Cattlemen’s Program, Dr. Roger Gates offered free forage testing for participants along with a survey for producers asking them to estimate what they thought the quality of the hay was (prior to testing). This survey resulted in 83% of producers under estimating the protein of th eir hay compared to the actual. This would result in the purchasing protein supplement when not needed. For energy, 50% over estimated energy. This would result in depriving needed energy during late gestation and early location. In addition to the previously discussed fetal programming issues, this could also cause delayed breeding. An actual example of over estimation of energy is illustrated in Figure 2. The over estimation could likely result in breeding delayed 42 days. The resulting loss in weaning weight could easily reach 80 lb, resulting in an approximate $120 decrease in value per calf. Through forage testing, the producer would know to feed 4 lb/d of a supplement such as corn gluten feed. Based on a 25-cow herd, this could easily return $1,920 above cost. That is a no-brainer! Brood cow nutrition is a crucial part of a beef cattle operation. Between fetal programing and maintaining the proper calving interval, it is imperative for producers to pay close attention to the nutrients available in their forages, and if they meet the requirements of their herd. If you have any questions on nutrition, hay testing, or developing winter feeding strategies, contact your local Cooperative Extension office (extension.uga.edu, or 1-800-ASK-UGA-1). Posted in Forages, Nutrition, Uncategorized. This entry was tagged Forage Test, nutrition, Winter Feeding. Bookmark the permalink.